(Newser) – If Osama bin Laden had lived much longer, al-Qaeda might have pulled a Blackwater and renamed itself. In one of his last letters, the arch-terrorist lamented that al-Qaeda had gotten a bad name from killing so many Muslims, the AP reports. Sounding like nothing so much as a CEO in the midst of a PR crisis, he suggested changing the group’s name to something more overtly religious. Any chance we could stop referring to these dirtball morons in benign, looking-toward-the-future corporate language? 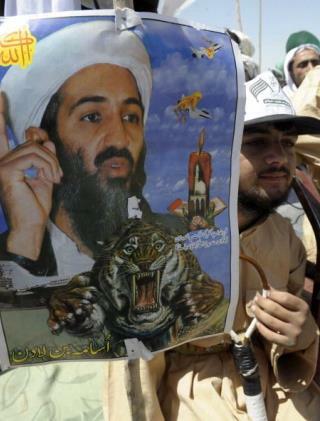 Osama wants to "rebrand" Al Qaeda. A continuing reference to them as "masterminds". The other day it was a story about how this human slug Al Zwahiri -- or wtf his name is -- is facing many "challenges" within the organization in the days ahead. The only challenge he's going to be facing is becoming a smudge on the side of some rock, with a lot of drone ashes scattered nearby. Have him "rebrand" that.